Showing results for tags 'CF3'. 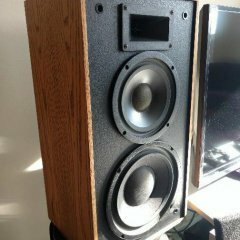 I am new to Klipsch and new to this forum. I grew up in the 80s outside of Hope, AR (in Texarkana) and always new of Klipsch as the pinnacle of speaker quality, although I could never afford them. Well, I found a pair of CF3 v.1s on my local shopgoodwill.com and go them for $350! They are in great shape. I'm looking forward to hooking them up and taking them for a test drive. However, I have a Harmon Kardon AVR520 tuner that I mainly used as garage listening with some old Sony SS-U7030s that I kept from my college days. Will this HK do the trick for a non-audiophile or should I look to upgrade the receiver? Can I just add an amp to boost the output? Please understand that I know very little at this point about the audio technical world, but I am willing to learn. So, please use layman's terms if you are able to provide any advice or feedback.